Sydney, July 7 : Former Australian star Glenn McGrath has predicted that the current Australian squad has the potential of cleaning out England 5-0 in the Ashes series which begins in Cardiff on Wednesday. Though McGrath had made a similar prediction before the 2005 series, the retired pace great said he was impressed by Australia's Test series win in South African this year. "I''ve got total confidence in the boys, especially watching the way they played in South Africa in the last Test series. That would have given them a lot of confidence and they showed what they can do and the huge potential that they''ve got," The Herald Sun quoted McGrath, as saying. "If they can do the same here and maybe even improve in one or two areas, they will do really well and probably win 5-0," he added. 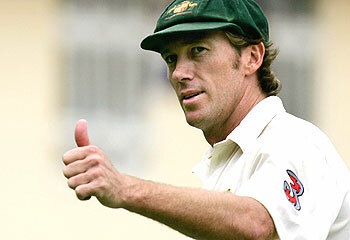 Earlier, McGrath was called into an Australian team meeting to provide essential tips to the new-look pace attack.